Sugar Alcohols: The “Good” Sweeteners? We’ve already covered the classic artificial sweeteners (sucrose, sucralose, and aspartame) and how they affect weight and the gut flora. Now it’s time for another group of zero- or low-calorie packets on the table: sugar alcohols. Despite the name, sugar alcohols don’t actually contain any ethanol, they don’t have the same effect on your liver, and they can’t make you drunk. But what they do contain is sweetness, and a lot of it. Sugar alcohols aren’t 0-calorie sweeteners, but they’re lower in calories than sugar. Table sugar has 4 calories per gram. Xylitol has 2.4, Erythritol has 0.2, Sorbitol has 2.6, and Mannitol has 1.6. That makes them popular in a lot of weight-loss recipes and diet products, and over the years they’ve also been praised for various different health benefits. Some people also prefer them because they’re naturally found in plants (e.g. mannitol is usually isolated from seaweed), so they seem less “processed” or more “natural” somehow. But “natural” isn’t a synonym for “healthy:” things are good or bad because of their effects on the body, not because of how “natural” or “unnatural” they are. “Low-calorie” doesn’t equal “healthy,” and we all know that not all health claims actually pan out the way they were supposed to. So here’s a look at the proposed health benefits and potential dangers of sugar alcohols. Sugar Alcohols, Blood Sugar, and Weight. One common claim on behalf of sugar alcohols is that they’re antidiabetic; that’s why they’re often used in sugar-free candies and gum. Because the carbohydrates they contain aren’t completely absorbed into the bloodstream, they do cause a smaller blood sugar spike than table sugar does. Theoretically, this ought to make them useful for weight control (although in that case, not eating any sweetener at all would be even better). There’s some evidence to support the antidiabetic effects of xylitol specifically, but it’s very rat-heavy. This study found that xylitol had an antidiabetic effect in rats fed a 10% xylitol drinking water solution, but no actual human wants to drink 10% xylitol water. This one found that, in rats fed an obesogenic diet, visceral fat accumulation was lower in rats fed 1 or 2 grams of xylitol per 100 calories. But here’s the catch: in the control group, the xylitol was replaced with starch. So was the benefit the presence of xylitol, or was it the absence of excess carbs on top of an already fattening diet? In humans very little high-quality research has even been done on sugar alcohols, and the studies we do have suggest that in the real world, under realistic diet conditions, there’s no effect. The other big benefit often claimed for sugar alcohols is for dental health, especially for xylitol, although some research has been done on erythritol as well. There actually does seem to be some truth behind this. Partly, that’s just because xylitol isn’t sugar. You could also replace sugar with any other non-sugar substance (or just eliminate sugar without replacing it at all) and get the same effect. But some of the benefits seem to also come from specific active effects of xylitol. Erithrytol may also have a similar effect, although the data is much sparser. The benefit isn’t enormous, but it does seem to exist, particularly for xylitol. Now for the downside: sugar alcohols can be very hard on your gut. If you already know you have a FODMAP sensitivity, you might have jumped at the word “sorbitol” in the list of sugar alcohols – and if you did, your instincts were completely correct. 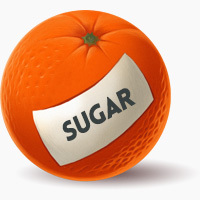 Sorbitol, and other sugar alcohols are FODMAPs carbohydrates. FODMAPs are certain types of carbohydrates that can cause gas, bloating, constipation, diarrhea, and other digestive symptoms in people who are sensitive to them. Specifically, sugar alcohols are polyols (that’s the “P” in FODMAPs). In whole foods, polyols are mostly found in stone fruits (e.g. peaches or cherries), mushrooms, and cauliflower, so if you react poorly to those foods, you might not do very well with sugar alcohols either. These carbohydrates might not be completely digestible to you, but the parts you can’t break down make a very tasty dinner for your gut flora, and the consequences aren’t always pleasant. For dramatic proof of the way sugar alcohols can affect your gut, look no further than the online reviews for any kind of sugar-free candy: you’ll see all kinds of people bemoaning the unpleasant consequences of eating it. It hasn’t been studied extensively, but sugar alcohols may also alter the gut flora. 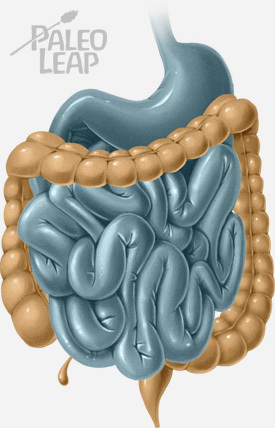 This study found that mice fed a 5% xylitol diet had altered gut flora at the end of the month. But a 5% xylitol diet is pretty extreme. To get 5% of calories from xylitol, you’d have to chew over 100 pieces of xylitol-sweetened gum every day. In fairness to sugar alcohols as a group, erythritol seems to be generally better-tolerated than the others, and rarely causes digestive problems. It’s also important to note that not everyone reacts to FODMAPs carbohydrates – some people may feel just fine eating sugar alcohols. But since they can be hard on your digestive system, a good idea is to at least do a trial elimination. Take them out and see how you feel for a week or two, and then try introducing them again. Sugar alcohols aren’t the devil, but they’re also not ultra-healthy superfoods. If you don’t currently eat them, there’s no real reason to start. In fact, they can be downright awful if you have a sensitive gut or a FODMAPs intolerance, and you might not even realize what an effect they’re having until you take them out. Sugar alcohols also don’t solve one of the very basic problem with artificial sweeteners: the more sweetness you eat, the more you crave. If you keep eating highly-sweetened foods from any source, then you’ll keep wanting that level of sweetness, which can just prolong cravings for the “real thing.” If they just go cold turkey on the sweeteners, most people find that their sugar cravings subside dramatically and all kinds of other foods start tasting “sweet” to them. On the whole, the ideal “replacement” for sugar is to just stop eating sugar. If you’re going to use a zero-calorie sweetener, erythritol is probably one of the better options, but a better alternative from the Paleo point of view would be to not use a sweetener at all.